Platforms, one of the five contextual essentials of successful e-governance, are containers of specific services. These can be used directly by the stakeholders or by other e-gov projects as an input. E.g. DigiLocker can be used as a service by the citizens and also as a platform for providing input into other e-gov services like passport or online university application, where the documents can be fetched directly by the respective applications. E-taal is one such platform initiative, which serves as a layer for auto-aggregating e-transactions across national and state level e-gov projects including the Mission Mode Projects. eTaal or Electronic Transaction Aggregation & Analysis Layer receives transaction statistics from web based applications periodically on near real time basis. It converts the data input into user friendly tabular and other kind of formats for better presentation. A wide variety of data presentation and slice by central/ state governments, e-gov project, time period etc is possible. Developed by the NIC for the Ministry of Electronics & Information Technology, Government of India, the eTaal platform can serve both as an interface for stakeholders interested in the statistics and also as auto-feed into other applications. E.g. the PM or the CM or other government heads may want a dashboard of e-gov performance under them. Among many other things, number of e-transactions can be one input, which can be directly fetched from the eTaal. The initiative also provides tools to add services to the eTaal application using .Net or Java based web services. 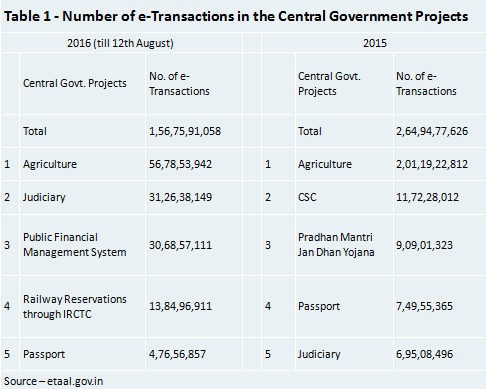 In 2015, total of 2.64 billion transactions were recorded in the central government projects, which stands at 1.56 billion till 12th of August in 2016. Agriculture topped the list, both in 2015 and 2016 (table 1). Service is requested through electronic means (self-access or assisted access) including mobile devicesIt is very important to discuss here how is an eTransaction defined. According to Maximum Governance definition, transaction is beyond simple exchange of information. The focus is on facilitating seamless transactions during the issuance of government documents, payment of government fees or taxes, registration of property, registrations related to business etc. 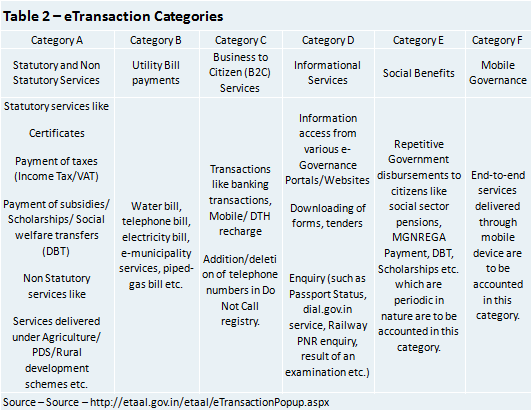 A comprehensive list of what is defined as e-Transactions is given below in table 2. At Maximum Governance, all the categories except the informational services (category D) are defined as transaction (refer our 5 stage model of e-governance focus depth).